Students who are not U.S. citizens or legal permanent residents must apply for a visa to study in the U.S. Unless you are coming to Roanoke College through a sponsored exchange program (ISEP, IREX, Brazil Science without Borders, etc. ), you will enter the U.S. in F-1 (non-immigrant student) status. To apply for an F-1 visa, you must have an I-20 Visa Eligibility Form from Roanoke College and follow visa application procedures. If you are coming through a sponsored exchange program, you will enter the U.S. in J-1 (exchange visitor) status and your exchange program will provide you with your visa eligibility form and instructions for getting your visa. In addition all of the information that will be sent to you by offices around campus, you will receive frequent updates during the spring and summer from the International Education Office about arrival arrangements, orientation, housing, course registration, our friendship family program, and other issues of interest. Any time you have a question, please contact Carmen Boggs-Parker, Assistant Director of International Education. Roanoke College is in the Roanoke Valley of Southwest Virginia, which has a mild climate with four distinct seasons. In fall and spring the weather is mild, with high temperatures between 55 and 80 degrees Fahrenheit. In winter, which lasts from December through February, temperatures are generally in the 40's Fahrenheit but sometimes go below freezing. You will need a coat, hat, and gloves in winter. 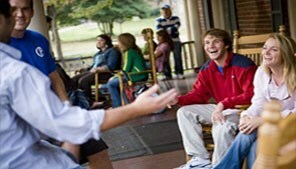 An extensive list of things students might wish to bring to campus is on the Student Life web page. You will not need all of these things, but the list will give you an idea of what you may want to bring or need to purchase after arrival. Electrical devices require both a converter and an adapter. Most small appliances can be purchased inexpensively in the U.S.
You will receive information from us about when you should arrive at Roanoke College. We provide free pick-up service to bring new international students to campus from the Roanoke Regional Airport or the Roanoke bus station. USAir, United, and Delta Airlines have flights to the Roanoke Regional Airport. Be sure to provide Mr. Couchman with your arrival itinerary. A special three-day orientation for new international students is offered each fall, with information sessions on academics, cultural adjustment, social life and student activities, campus services, and practical matters like banking and cell phones. There are also tours of the campus and surrounding area, optional shopping excursions, and free time to meet new friends and settle into your room. You will receive information about the international student orientation from our office. The schedule is also available on the orientation website during the summer. 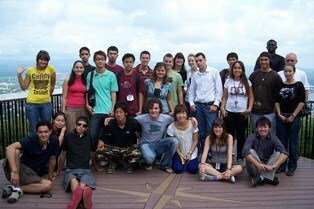 There is no charge for international student orientation. Following this special orientation, international students join all new students for orientation activities. All students in F-1 status and some students in J-1 status are allowed to work at jobs on campus. You will learn more about the requirements at international student orientation. Student jobs are posted on MaroonNet through the Career Services website. You can begin looking for a job even before arrival by referring to this website. Note that international students are not eligible for campus jobs that indicate "work-study students only." You will get more information about campus jobs at international student orientation. Depending on your TOEFL score, you may be required to take an English placement test during international student orientation. The results of that test will indicate whether or not you will need to enroll in our Advanced English as a Second Language course in your first term. 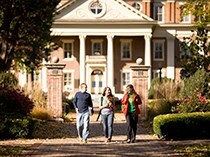 The course is designed to improve skills in the reading, writing, and oral presentation skills required to succeed academically at Roanoke College.